Magic Bubble © 1998 Yun Sung. Group 3 or more bubbles of the same colour together to make them disappear. Clear the screen before they reach the bottom or before your opponent clears their screen. 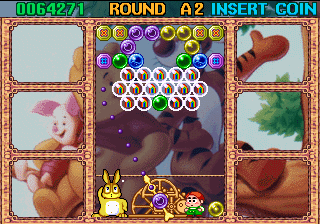 Magic Bubble is a very obvious copy of Taito's sublime "Puzzle Bobble" series. This game is a hack of "Puzzle Bobble 4". The level design, gameplay, and map layout are identical to Puzzle Bobble 4. The bubble and block graphics have been slightly changed, and the music and backgrounds have been replaced by ones from other sources. Some of the backgrounds have been ripped from "Earthworm Jim 2", and "Rayman". There is no copyright date found on the title screen, but "Puzzle Bobble 4" was released in December 1997, so "Magic Bubble" can't be older than 1998.